Water Street Home The Tip Of The Fatberg! The Tip Of The Fatberg! 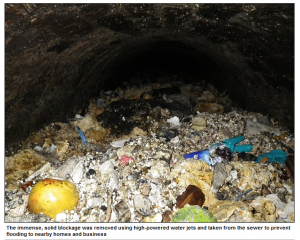 Try justifying those thoughts to the crews in London who worked tirelessly for four straight days last year to break up a “fatberg” the size of a jumbo jet found in a stretch of West London sewer lines. They worked hard and they acted fast because they knew where it could lead – the shutdown of the sewer lines, or even worse, the breakdown of the lines causing not just to a “minor inconvenience” for residents in the area, but “nose pollution,” flooding, and more. The fatberg crisis is so great that the BBC recently aired a documentary series, “Watermen: A Dirty Business,” that vividly demonstrates the very real concern of improper disposal down drains, as well as the vast amount of work and money it costs the public to break up fatty blockages in pipes. It also offers great food for thought (food NOT to be disposed down the drain!) as to the variety and importance of water system workers who are on the job every day to both keep water lines healthy and in working order… as well as to “tackle the beasts” created by misuse. Never pour oil, grease or fat down the sink. And, NO, following grease with hot water or dishwashing liquid will NOT counteract the problem. Even if a wipe or similar product says “flushable” you should refrain from sending it down the toilet. Only human waste and toilet paper is safe to flush. Other items that commonly are flushed or rinsed down the drain but never should be include: dental floss, paper towels, bandages, diapers, any fatty food products. Keep a plastic container near your kitchen sink and scrape dishes thoroughly into it before washing them or loading them into the dishwasher. If the thought of a jet-sized block of fat lurking under your streets doesn’t particularly bother you, here’s one more fact: According to Thames Water Utilities Ltd., up to 50% of the money you lay out for monthly sewer bills can very well be going toward servicing the buildup of fat blockages in the wastewater systems. So the next time you may want to flush that little bit of floss, or pour that leftover frying oil down the drain – ask yourself, could that just be the tip of the fatberg? !